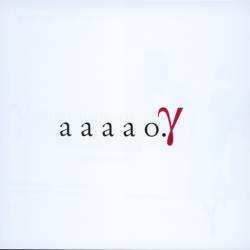 a a a a o is a strange debut album by an even stranger band. Although the band name is sounding like some Greeks rediscovering Darwin's Theory of Evolution, the four musicians are from Germany. Instead of choosing the quite banal idea to name the debut album like the band, Gammalapagos decided just to concentrate on the vowels featured in the band name. For a debut, the songs played by Gammalapagos are astonishingly mature. Although it's obvious that Radiohead are their major influence, Gammalapagos are much more than just a simple clone. Even if both bands feature high-pitched melodic vocals, unusual instruments (like for instance a vibraphone or an organ), complicated song structures and lots of pathos, Gammalapagos' songwriting is much more unusual. Several songs like The Rumour or Live Love contain noisy, distorted parts which draw parallels to Sonic Youth. Furthermore, there are songs with blues (The New Song) and jazz (This Is What I Feel For You...) elements. The most interesting fact about their music is that Gammalapagos don't care about classic conventions. Noisy and quiet parts change so often in a way to deliver a very creative output. Towards the end, the album is becoming less extreme and more listenable for a bigger audience. The album doesn't contain any negative parts, it's just a pity that it's already over after only 36 minutes.